Special Pre-Launch Offer: Get access to all of our courses, live training, and private groups for life! For a single one-time investment. Sign up before our official launch for unlimited lifetime access ! Online social media training for business owners & their teams. SocialCademy is an online training platform where you can learn everything you need to know about using social media to grow your business and your income. Whether you’re looking to train yourself or your team, SocialCademy has the information you need to dominate social media, stand out, make more money, and crush the competition. What are you waiting for? 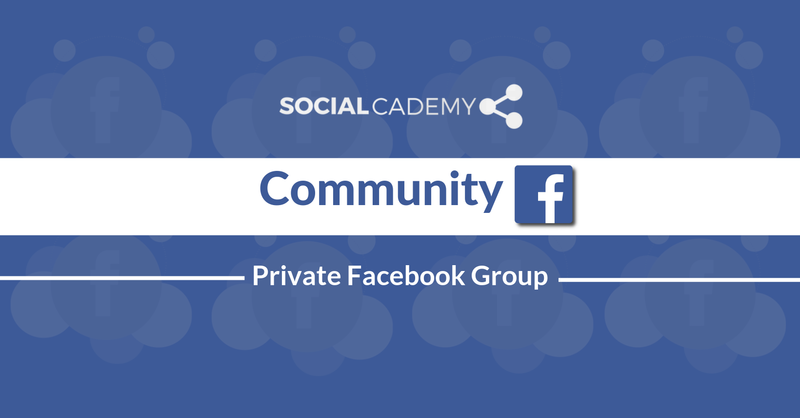 Private Facebook group to network with others students, and get realtime support from our team and instructors. Members-only monthly webinars where you'll learn fresh material from course instructors live each month. On your computer, or on your mobile device, access training content whenever and wherever you want. Lifetime access, single one-time fee. Limited spaces available, enroll now! SocialCademy is going to launch by the end of March 2019 as a monthly membership site. That means students will pay hundreds of dollars per month for as long as they want access to the courses, monthly live training, and private group. But for the next few days, you have a unique opportunity to get access to all of the courses and bonuses, without paying a monthly membership fee ever! Sign up now, for a single one-time payment, before we release all the courses and bonuses, and you'll get unlimited access to everything for life. Are you in? Let's get started then! Sign up and get instant access to all of the courses and bonuses. After building and selling several small businesses before the age of 22, I fell in love with the process of marketing and scaling businesses through online channels. I doubled down on my strengths and launched my own social media marketing agency in late 2016, Suits Social Inc. Helping businesses across Canada do just that. Ryan is a well-known digital marketing expert, and co-founder of Affluent Attraction, a company which helps Financial Planners sign high-paying clients online. He’s also the founder of Ryan Holmer Consulting; a company which has helped HUNDREDS of entrepreneurs and business owners learn how to run profitable advertising campaigns on Facebook. Josh has traveled the world with some of the top Youtube influencers. Capturing, editing, and promoting videos that have amassed tens of millions of views on YouTube and other social platforms. Josh's passion for video and YouTube goes back nearly 12 years, and he continues to be one of the top authorities on producing powerful content that sells!